Hi. My name is Jess(ica). I’m here because I used to be a coffee addict. Actually, no, that’s not true- I guess I still am technically a coffee addict, I’ve just gotten better at controlling my need for it. There came a time when I HAD to have some form of coffee every day just to function; sometimes I could take it straight, sometimes I wanted it in the fancy gourmet styles from coffee shops. I didn’t care. I just wanted coffee. I needed it. It took a while for me to hit rock bottom, to finally realize that my addiction to coffee was getting out of control. I wish I could say that I had this grand epiphany or moment of clarity/acceptance, but the truth of the matter is that I just finally got tired of spending $28 a week on the stuff at coffee shops and knew that I had to make a change. It wasn’t easy in the beginning. The caffeine withdrawals were rough; chronic headaches and irritability are a lethal combination, or so I found out. However, I pulled through- at first going cold turkey, then tapering back on to the point where I can have some form of coffee a couple of times a week without feeling as though I’ll go crazy without it. So yeah, for anyone out there still being affected by coffee addition at present: recovery is possible. And it doesn’t even have to mean that you give it up forever. You just gotta find a balance. Most times, when you think you need it, you don’t and you can pass. And sometimes…maybe the situation’s a little different. For instance: there are some instances where a cup of hot coffee is a must. There’s no way around it. I certainly found that to be the case for this recipe. Aside from the profit that their over-priced drinks bring in, I’m pretty sure that a huge chunk of Starbucks’ money comes from the pastries that they display smack dab right in front of the customers in those glass cases. How many people can go in to buy a cup of coffee there in the morning without even stealing a longing gaze at the delectable cinnamon rolls, pumpkin bread, muffins, scones and other goods that Starbucks sells? I’m not one of them, that’s for sure. I just had to clarify 1 thing: this picture is to scale. This bad boy is actually that big. This recipe is actually one I’ve had pinned on Pinterest for a long time now. Scones was something I’ve never made before, but have always wanted to. They’re the quintessential accompaniment to coffee- hot, buttery and crumbly pastries of deliciousness. The only thing that could possibly improve them would be to add a unique flavor and ingredient…enter the bananas. You guys, even before I tasted them, I just knew that these babies were going to be sosososoSOOO good. I mean come ON: look at how fat and thick the scones turned out. See those flaky layers? It’s the cold chunks of butter that does that. Chilling the dough in the freezer was the secret weapon for the scones, I’m convinced. 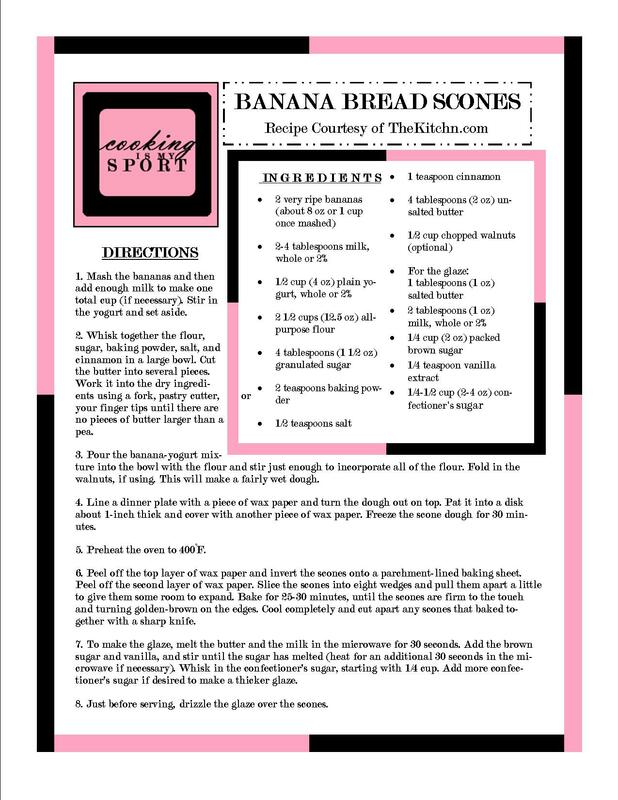 I think it’s something that I’ll definitely be doing for any future scones to come out of my kitchen, as well as for whenever I make biscuits. The glaze just sends them over the top. This recipe is one of the best, most satisfying that I’ve tried, and I highly recommend it. 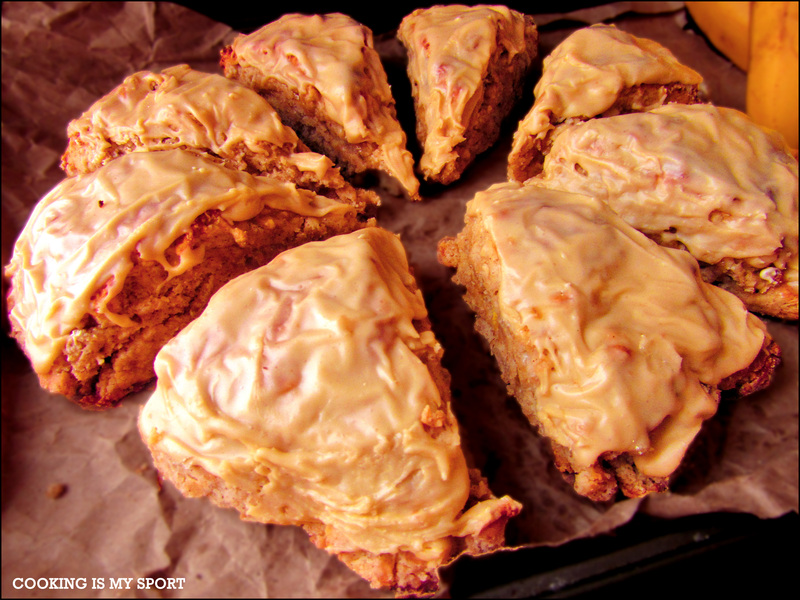 Oh yeah…and the scones are even better when enjoyed with a cup of coffee. Just sayin. 1. Mash the bananas and then add enough milk to make one total cup (if necessary). Stir in the yogurt and set aside. 2. Whisk together the flour, sugar, baking powder, salt, and cinnamon in a large bowl. Cut the butter into several pieces. Work it into the dry ingredients using a fork, pastry cutter, or your finger tips until there are no pieces of butter larger than a pea. 3. Pour the banana-yogurt mixture into the bowl with the flour and stir just enough to incorporate all of the flour. Fold in the walnuts, if using. This will make a fairly wet dough. 4. Line a dinner plate with a piece of wax paper and turn the dough out on top. Pat it into a disk about 1-inch thick and cover with another piece of wax paper. Freeze the scone dough for 30 minutes. 5. Preheat the oven to 400°F. 6. 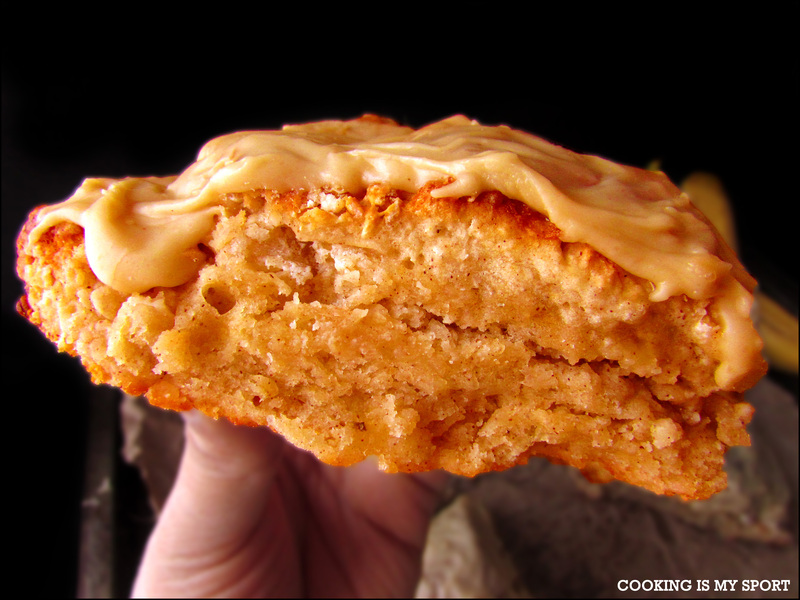 Peel off the top layer of wax paper and invert the scones onto a parchment-lined baking sheet. Peel off the second layer of wax paper. Slice the scones into eight wedges and pull them apart a little to give them some room to expand. Bake for 25-30 minutes, until the scones are firm to the touch and turning golden-brown on the edges. 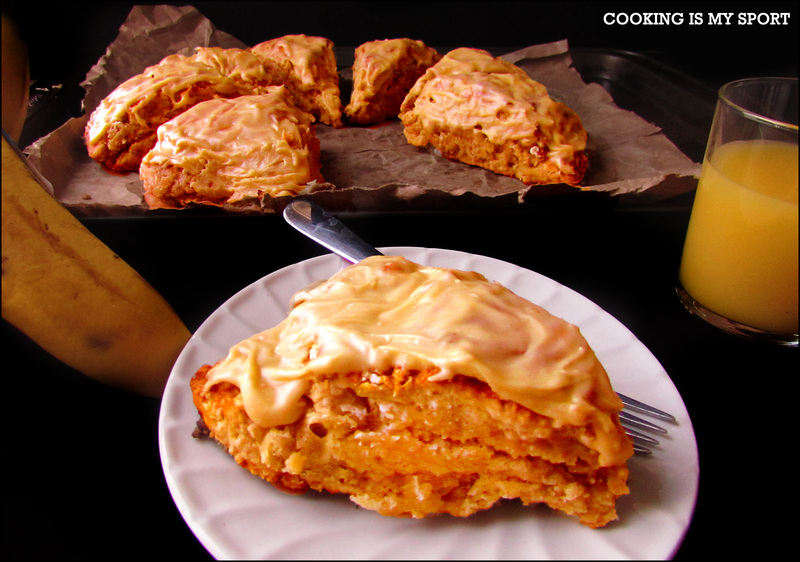 Cool completely and cut apart any scones that baked together with a sharp knife. 7. To make the glaze, melt the butter and the milk in the microwave for 30 seconds. Add the brown sugar and vanilla, and stir until the sugar has melted (heat for an additional 30 seconds in the microwave if necessary). Whisk in the confectioner’s sugar, starting with 1/4 cup. Add more confectioner’s sugar if desired to make a thicker glaze. 8. Just before serving, drizzle the glaze over the scones. How did you know I had 3 extremely ripe bananas looking to be baked? You’re very accommodating … Thank you! These look positively delicious! I used to be a pretty bad Diet Coke addict, so I know your situation. Great look scones! Love this idea! 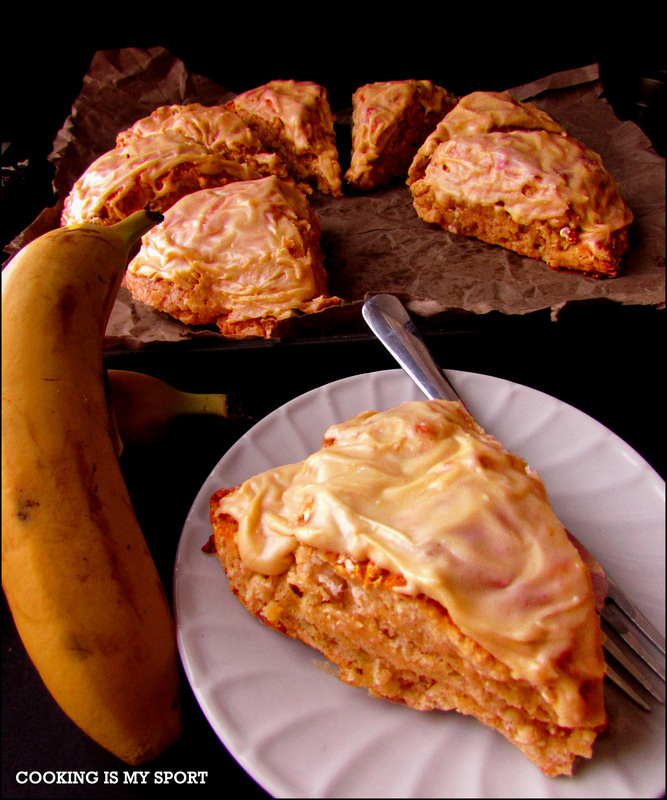 Banana Bread is so fantastic on its own – why not make it into a scone? Looks fantastic! I’m not really a coffee drinker…well, that’s not entirely true…I’m just not hooked on it. I switch back and forth between coffee and tea. I’m more of a tea drinker! !